Another in my series of audio blog posts about the inauguration of the ALMA Observatory in Chile's Atacama Desert. I had almost forgotten how anxious I become when I have to head out on a long trip by myself. But my daughter got me to the airport in plenty of time. I was in a humongous terminal waiting area all by myself until a few minutes ago. Now my fellow travelers to Chile are dribbling in. I should say anxious, yet excited. Our hosts seem to have planned out everything extremely well. Last night I printed out a big, beautiful brochure created just for the ALMA inauguration ceremony. We have the media itinerary, too. I'm a bit concerned that we won't have as much time as expected to acclimate before we leave the OSF for the AOS. That's Operations Support Facility, at a mere 2,900 meters, to the Array Operations Site, at 5050 meters. We're also warned that some attendees will not pass the medical exam required before reaching for the stratosphere. I'm optimistic. Last Tuesday, the National Science Foundation produced a very nice webcast that described its support for ALMA, through the National Radio Astronomy Observatory. Jim Ulvestad was one of the participants. 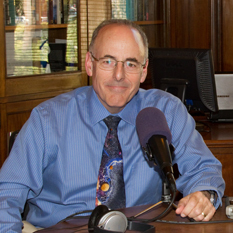 He is Director of the Division for Astronomical Sciences in the NSF's Mathematical and Physical Sciences Directorate. Jim provided a welcome to those of us who would be heading to Chile. Later, he was asked about the international nature of the ALMA project. My plane begins boarding in ten minutes. I'll post again as soon as I can, probably from our gathering place in Santiago, the capital of Chile.